In the quest for an ecologically ethical city, we have seen London brought to a grinding halt. We have congestion charging, toxicity charging, low emission areas, low emission zone charging, traffic exclusion zones, cycle lanes knocking out entire traffic lanes, un-coordinated road works, a massive over-subscription of private hire vehicles, buses running at a quarter capacity, everything that you could possibly do to completely cripple London has been, and is continually being done. The motorist no longer has any voice whatsoever, as the "anti-car" lobby becomes one of the most powerful lobbying machines in the UK. The motorist has now become impotent with no real representation whatsoever. Less is more, Transport for London along with many boroughs across London have adopted the "all stick, no carrot" approach, but this approach is fundamentally damaging to just about everybody except for a small minority. As the government receives penalties for the UK's air quality, it seems on first sight that they may be threatening to pass those fines onto local government, unless there are concerted efforts to tackle the situation, which in itself isn't fundamentally wrong, but the implememtation as to how to tackle the many issues facing London and other cities is completely flawed. Nobody is saying that we mustn't clean up London and we mustn't move forward, for anybody to suggest otherwise is a fool with a spurious agenda, but the way the current policies are being implemented has made a bad situation a lot worse. How can you possibly have a congestion charging system in London, which is then augmented by a toxicity charge, only to be then followed up, inside those zones themself with a low emission area, banning all but electric vehicles, something which has been implemented in Islington amd Hackney councils, that in itself is completely ludicrous. Neither Hackney, nor Islington are seperate enclaves within London... they are a part of London. The roads which they have designated as part of their low emission area are of very little consequence to passing traffic, you would never enter those areas unless you had to specifically go there, yet both councils are using the spurious argument that pollution is unacceptable within the area. If pollution is significantly high in that area it isn't because of the volume of traffic flowing through there, it is because road traffic on the boundary of that area have been reduced to a snails pace due to appalling road planning, thus creating pollution, which is being taken into the restricted zones by the weather and atmospherics. A slow or non-moving vehicle will always be a more polluting vehicle, cars really aren't designed to perform at their best or most efficient when they are stuck in first and second gear, but then you don't have to be a rocket scientist to see why cars are slow or non-moving. London itself is gridlocked, after having many discussions with members of the public, not one single individual who I have spoken to has agreed with either TfL or any given London boroughs road traffic policies. From tourists to businessmen, from other road users such as van drivers to motorcyclists, the same comments seem to permeate. Some business owners have said that they will be moving their businesses away from London because of the problems getting in and around the capital, many tourists have been under-whelmed at the way surface transport performs, with some journeys in taxis and private hire vehicles as well as buses taking in excess of an hour to travel less than three miles, in fact a significant proportion of tourists have actively stated that they will avoid travelling to London in the future. This is the thin end of the wedge for many. 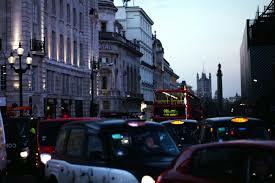 Prior to the implementation of the Congestion Charge, traffic levels were high, but traffic moved moderately freely. Yet whilst it is true that we have had some increase in traffic levels since the Congestion Charge came into operation , we have seen pollution reach record levels and traffic travel times almost flatline. As said earlier, this is no accident. It seems that this has become a very deliberate act across the board to create this situation so that drivers become forced to pay through the nose in one format or another. There is no profit in keeping traffic flowing. Moving across to the electric vehicle scenario, the whole strategy is an absolute screw-up of gargantuan proportions. There are less than 1000 charging points across London, with many vehicles unable to do more than 100 miles on a single full charge. You also have the situation where many people cannot have a charging point where they live because of logistical issues. The cost of the vehicles themselves are eye-watering, with no real second-hand market as yet, due to the newness of the technology and the woeful lack of infrastructure, this means that as per usual, those who can least afford it are the ones who get penalised the heaviest, unable to be able to afford to change vehicles, which are for many a necessity. You will of course have the usual cries from the overly self-entitled that people should always use public transport... but again for many it is unaffordable and totally impracticle, more importantly why should they have their freedom of movement curtailed at the behest of somebody elses view or belief. We also have this utterly brainless situation where you have 700 electric taxis on the road, again with almost no infrastructure available to charge the vehicles. With many charging points being used as parking spaces by third parties, the whole situation is a mess. If you allie that to the fact that Hackney and Islington councils (yep we return to those two again) have effectively banned the other 22,800 diesel taxis, (which still have up to a 15 year lifespan) from their low emission area, thus forcing those drivers to contravene two sovereign acts of parliament, the 2010 Equality Act and The Hackney Carriage act, both compelling a taxi driver to undertake journey's into the exclusion zone, you then have this barmy situation where a section of the public transport infrastructure in London cannot effectively function properly. The cycle lane initiative is an emotive one, nobody wants to see a single person injured, cyclists, pedestrians, motorcyclists, drivers, everybody must be able to move around London safely, but let us all be honest, an eastbound traffic jam by Tower Bridge at 2am on any given night should never be the norm. In fact it never was the norm, until the Cycle Superhighway along The Embankment was built, now, that 2 am traffic jam is a regular occurance. The Embankment isn't alone, this situation has been replicated across London, the only people who win are a very small minority. There seems to have been absolutely no consultation or modelling with anybody from the road transport industry. We can make cyclists safer, but this, most certainly, is not the way to do it, for every cyclist saved, how many drivers are being killed sitting in pollution from traffic which has been created by the Cycle Superhighway project... we must have balance. TfL will of course state that the public have been consulted, and it is true, they have been, however if only one or two per-cent of those who live or work in London have responded, that is hardly any sort of representation or mandate to proceed with a project. Quite frankly a five year old child can see the current plans are an utter failure, and no amount of computer-generated, Utopian vision of what Londons landscape could look like will ever change that, and so we spiral into an ever increasing cycle of traffic, pollution and cost. There is no single solution to the problem, but for any future road planning initiatives, there must be representatives from professional driving bodies placed on planning committees so as to bring balance to what has become an utterly intolerable situation. London needs to breathe, London also needs to move.